The Obamaliar told us that everyone making under $250k gets a tax cut, and everyone over that gets a tax hike. So that means $250k is “rich”. But that’s OK, because you won’t get the tax increase unless you make over $200k. Joe Biden agrees. Anyone making over $150k is rich and subject to a tax hit. Bill Richardson thinks that’s a great idea: hit those evil “rich” folks making over $120k. See a pattern? And with even the Uhhh-bama shills at CBS noting that there’s no way to pay for The One’s $1 trillion in new spending, even with a tax hike on those making over $250k, this lowering of the “rich” ceiling would certainly explain how they plan on covering the shortfall: they’re going to raise middle class taxes, too. The One of Supremely Thin Skin decided to kick reporters off of his plane if they worked for newspapers that endorsed McCain. Par for the course for his heavy-handed, Big Brother, intolerant campaign. Just to summarize things: When McCain kicks off a columnist of the NY Treason Times, a paper that wrote a fact-free innuendo-heavy sourceless hit piece on him, he was decried by the left for being against “freedom of the press” (as in, freedom to write baseless stories on Page A-1). When the Obamessiah does it? Eh, no big whoop. Change you can believe in, ladies and germs. LGF has the story about the big protest that occurred outside of the LA Times‘ place yesterday, along with a link to the video and pictures from the protest. As LGF notes, the latest excuse, and one that the LAT seems to be settling on right now, is that the “source could get put in jeopardy”. But a detailed transcript of the tape’s contents wouldn’t reveal a single think about the source, yet oddly enough, that transcript has never been produced. Funny, that. Story 1: We’ve adequately covered the tape. We don’t need to cover it any further. Story 2: The source gave it to us only upon the condition we not release it, which we kinda-sorta forgot to say last time. Story 3: If we released the tape the source could be in actual jeopardy, which we forgot to mention the last two times. Tomorrow’s story: Releasing the tape would Cross the Streams. An effigy of US Republican vice-presidential nominee Sarah Palin hanging by a noose as part of a Halloween display has drawn severe criticism, but local officials said the homeowner was covered by free speech rights. Two men have been arrested in connection with an effigy of Sen. Barack Obama that was hung outside a building at the University of Kentucky in Lexington, police said Thursday. Authorities found a life-size effigy of the Democratic presidential candidate hanging from a tree outside the school’s Mines and Minerals building on Wednesday morning, police said. Hanging an effigy of Sarah Palin from a noose? Why, that’s just chortle-provoking, side-splitting, satirical hilarity right there, all in good fun. And legal, too. First Amendment rights and whatnot. Hanging an effigy of The One? Latent KKK tendencies coming to the surface in these little Hitler clones! And illegal, too. First Amendment rights? Never heard of them. The moral of the story? The next time you feel like swinging an effigy from a noose to make a political point, pick a white female doll to hang. 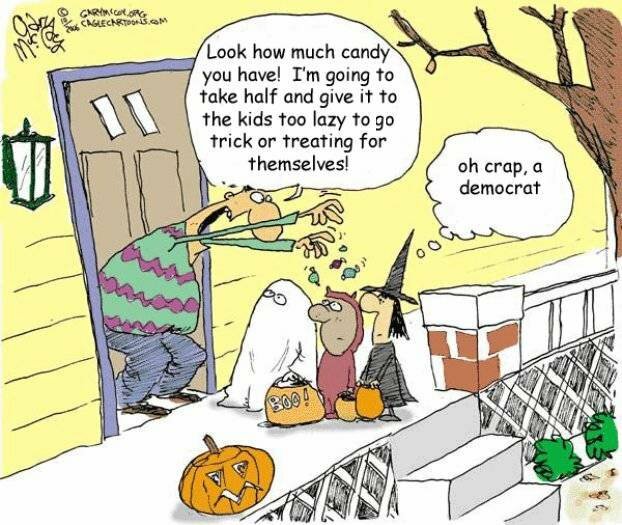 Bonus points if the doll represents a Republican. Exit question: When did the “free speech rights” of the first group stop existing for the second group? The LA riots, a VP candidate misspells potato, Nirvana is top of the charts, Sinead O’Connor rips up the Pope’s pic on SNL, Spike Lee gives Obama some of his favorite lines in Malcolm X, the economy slides into the clammy embrace of recession. And a young presidential candidate puts a big bear hug around the electorate’s largest demographic by repeatedly promising a middle class tax cut. Now there are campaign promises and there are Campaign Promises. This one is historic because not only was it quickly broken, but within months it was replaced by the Largest Tax Increase In American History. Quite a switch — did I mention that The Crying Game came out in 1992 as well? Broken promises of middle class tax cuts? We’ll meet again. Democrats haven’t done a tax cut since JFK almost a half-century ago. If, by “clear lead”, you mean “3% – 4%” in multiple sources (including 4% in PA), then yeah…”clear lead”. Like I said before: polls are crap. They never predict turnout. Well, add another Uhhh-bama relative living in squalor: his aunt. The media told us that when Obama visited his grandmother, it spoke well of his character. It seems fair to take the living conditions of his extended relatives as a similar glimpse into who this man is, and whether his personal actions match his lofty rhetoric. 1 Timothy 5:8 says “If anyone does not provide for his relatives, and especially for his immediate family, he has denied the faith and is worse than an unbeliever.” “Spread the wealth around”, indeed. Hope and change and yada-yada-yada. This man is truly vile and despicable. May God’s will be done. In NC, The Obamaliar told everyone he’s not a socialist and he’d appreciate it if folks would stop referring to him as one. Aside from his well-documented “spread the wealth” and “SCOTUS should have forced redistribution from the bench” comments, and aside from his work with the Democratic Socialists of America, and aside from his attending socialist conferences while at Columbia, and aside from his admission that he “carefully” chose and sought out Marxist friends and professors…aside from all of that, there’s no reason to believe that he’s a socialist wolf in sheep’s clothing. Obama’s informerical full of lies, says…the AP? Obama’s assertion that “I’ve offered spending cuts above and beyond” the expense of his promises is accepted only by his partisans. His vow to save money by “eliminating programs that don’t work” masks his failure throughout the campaign to specify what those programs are – beyond the withdrawal of troops from Iraq. Mr. Woodward may want to go check his credit report in the next few days to see if any unauthorized inquiries have been done. Hopefully, he doesn’t live in Ohio. UPDATES KEEP ON COMING, BELOW. The moral of the story? Don’t ask questions of public officials…they and their surrogates will make your life a living Hell. BTW, it looks like Ace beat the C-bus fishwrap to the story. Kudos, Ace. UPDATE (10/28/2008 – 07:20 A.M. EST): Well, well, well! It looks like the initiator of this brownshirt snoop job is none other than the OH Secretary of Job and Family Services…a Democrat who just so happened to donate the max amount to Barry O and who, as sheer luck would have it, initiated the search right after the third debate whereby Joe’s name was invoked against The One. But the governor of OH, who just so happens to be a Democrat, is satisfied there’s no political motive here. Well, isn’t that reassuring? The left gets bent about Bush snooping on al Qaeda phone calls, but on American citizens who ask leaders questions? Not so much. UPDATE (10/28/2008 – 08:50 P.M. EST): Joe the Plumber’s got himself an attorney. Plus, the snooping has come from three different government agencies in Ohio. One is the aforementioned Secretary of Job and Family Services. Another is an outside contractor with access to the Attorney General’s test account. Then there is the Toledo Police Dept., and a clerk there has been charged for it. UPDATE (10/30/2008 – 07:55 A.M. EST): More extensive than we thought. Big Brother ‘Bama ought to be a hoot when he’s officially running the Snoop show, eh? McCain criticizes Frank for his contribution to the financial mess, and Frank whips out (OK, bad choice of words! )…yep…the “gay card”! Frank yesterday dismissed McCain’s words as “an appeal to prejudice” that he said reminded him of past Republican efforts to raise voter concerns about the prospect of congressmen Charles Rangel and John Conyers, who are black, becoming committee chairs. Is it possible that we’re a little torqued that Barney Frank was bouncing Fannie Mae orbs off his chin while going to bat for Fannie/Freddie during his day job? Maybe we’re a bit bent that he and his ilk have destroyed our economy, especially the mortgage sector? Perhaps we detest his socialist “let’s tax the rich more and gut the Defense Dept. budget” words of wisdom? The news has gone national now, and the McCain team is demanding that the LA Times do their freakin’ jobs and release the tape. Heck, even the Obama shills at Politico are admitting that they would have to release the tape if they had it, on account of the newsworthiness of the tape. But judging by the LAT‘s layoffs and circulation numbers, they stopped caring about the news a long time ago. The LAT‘s response? It’s old news. Fine, then surely they wouldn’t mind handing over a copy of the tape to the “slower” MSM outlets, since the LAT scooped it so long ago…right? Yeah, right. Source: I have a video. It’s pretty big stuff. Source: Yeah. You want it? Source: OK. But you can’t use it. LAT: What? Then why are you giving it to us, a news outlet, if you don’t want us to use it? Source: I dunno. Just thought it would be cool to give a tape with newsworthy stuff to a news organization, only to make sure that said newsworthy stuff never saw the light of day. LAT: Heck, you could have given this tape to your mom or your dentist…heck, even to the Obama campaign!…if you wanted to just give it someone and didn’t want it leaked. Source: True. But I’d rather give it to a news organization to not be used. If you want it, you have to pinky swear that you won’t show it. LAT: Deal. At least we can say that we swore to secrecy in order to defend our ever-shrinking credibility. Over six months ago the Los Angeles Times published a detailed account of the events shown on the videotape. The Times is not suppressing anything. Just the opposite — the L.A. Times brought the matter to light. By the way, the conservative blogosphere is ponying up a reward (thus far at $150k) to anyone who can get a copy of the tape…provided it’s not a CBS operative’s copy of the tape, of course (their track record on authenticity is a tad “shady”, to say the least). Maybe a soon-to-be-pink-slipped LAT employee who needs the cash? The 2008 Hip Hop Awards came on the other day and it proved one thing to me. Some black folks will be dumb until Jesus comes back! How can anyone look at pimps, thugs, and gangsters as a good thing that needs to be celebrated? How did Hip Hop become the voice of our youth to the point that the black church is bending over backwards for it’s acceptance? This is a shame. But one thing that they did on this show that really got me going was the push for a “black” vote in the election. Not knowing the issues at hand, but yet and still, they constantly pushed the young folks and HIp Hop fans to “vote black” this election. …I’m sorry folks, but we can’t stay on this road. This is the road that leads to the accepting of the mark of the beast. This is the road that hides the truth and promotes the lie. This road will get you voting for economics rather than morality. And that’s the road that will lead to the antichrist! The bible said that in the end, you will not be able to buy or sell unless you pledge your allegiance to the beast! Buy or sell? That’s economics. Thats money! And if you are voting for economic reasons and not considering morality or your own convictions, then you are essentially doing exactly what the bible predicts will happen in the end. People will begin to vote in the man that will lead us to the antichrist and the end. They will vote this man in based on economic issues and popularity. He will be voted in because of the financial crisis of the government and people will not even consider his true moral ethics. Black Christian leaders have totally abandoned the bible in this election. They have chosen culture over Christ and have accepted the 3 things that the antichrist will implement in his rule. Abortion, Homosexuality, and the silencing of the truth! These things are on the table and being ignored because of the color of a man’s skin? …God forbid! I will not be guilty of ushering in the antichrists policies because a man is of color! I am not practicing to receive the mark of the beast. And if you are voting against your own beliefs and bible for the sake of money, color, or party biases, then you have just passed the mark of the beast test. You have just proven that socialistic reasons supersede your spiritual convictions! And this is exactly what the antichrist will do. He will exalt himself above God and make his immoral beliefs acceptable by all. And without question we see that Barack Obama has caused preachers and pastors, great and small, to follow him in spite of his antichrist morals. Abortion, homosexuality, and the silencing of the church are on his ticket and yet black church folks don’t care. The very things that are killing us as a people are the very things that we are in favor of. The scariest part is that this is just rehearsal for the coming rule of the antichrist and the black church has lined up on the wrong side! I’m not saying that McCain is the answer, but I’m saying that if you are voting, your convictions as a believer in the bible should out weigh every thing else. Congrats to people like jen who have decided to cast their lot with the mark of the beast. Good luck explaining that one to the Almighty. It’s late in the hour and Jesus is taking notes on where you stand. Your vote is your stand. And it would be better to not vote at all than to cast a vote for the very agenda that the antichrist will promote. Amen, fellow Brother in Christ! If you have moral objections to voting for McCain, then by all means, do NOT vote for him! But as I mentioned before, you cannot call yourself a born-again Christian and vote for Obama. Period, end of discussion. Please read the post…it’s excellent reading! First, we see him tell Joe the Plumber that we need to “spread the wealth around” amongst all of the non-producers. Then, we find out he said back in 2001 that it was a crying shame the “non-radical” Warren Court (and, presumably, subsequent courts) didn’t get more proactive in redistributionism. …The current proposals for welfare reform are intended to eliminate welfare but it’s also true that the status quo is not tenable. A true welfare system would provide for medical care, child care and job training. While Barack Obama did not use this term, it sounded very much like the “social wage” approach used by many social democratic labor parties. By “workforce preparation strategy”, Barack Obama simply meant a coordinated, purposeful program of job training instead of the ad hoc, fragmented approach used by the State of Illinois today. The state government can also play a role in redistribution, the allocation of wages and jobs. As Barack Obama noted, when someone gets paid $10 million to eliminate 4,000 jobs, the voters in his district know this is an issue of power not economics. The government can use as tools labor law reform, public works and contracts. Obama, version 1996 and 2001, had no problem talking about government action to effect redistribution of wealth in communities. He showed a tendency to see economics as a power display rather than as a legitimate maximization of capital and profit. Look at Obama’s analysis of a cutback; according to Obama, the only reason companies lay people off is to demonstrate power, not to make more efficient use of funds (or to pay ever-more exorbitant tax costs). That sounds as though it comes from an outlook more couched in Karl Marx rather than Milton Friedman. And the Socialists in Chicago ate it up. Again, I ask: Where on Earth would anyone get the idea that Obama is a socialist? The Alaskan porkmeister has been convicted on seven felony counts for lying during his corruption probe. Obviously, lying under oath is a crime…unless you’re a popular Democrat president, in which case it’s no big whoop. Snark aside, I’m glad to see Stevens go. Yes, I know it’s another Democrat seat in the Senate, and from a cherry red state, too. If the guy sides with Reid and company too much, then AK will boot him Daschle-style in six years. The state GOP, having learned nothing about Ol’ Boy politics from their recent run-ins with Gov. Palin, needed another attitude adjustment. They threw their money and support behind Stevens in the primary, and now they’re going to needlessly lose. They should have actively supported his primary opponent, and this wouldn’t even be a competitive race. As such, they deserve to lose this seat. Stevens was so hopelessly and shamelessly corrupted by a sense of entitlement that pervades D.C. He needed a correction something badly, and he got one. The GOP needs to have newer, fresher faces reforming the party from the inside out. It needs people who are committed to a smaller, more limited federal government, and being the King of Pork betrays that commitment. Finally, the rule of law prevailed. Rather than being outraged that some people get away with breaking the law (especially high profile Democrats), we should rejoice that a truly guilty man was judged accordingly. May Stevens seek God’s (and Alaskans’) forgiveness for his actions. UPDATE: MSM sitting on video of Obama at anti-Semitic shindig…toasting PLO operative! Introduction: The LA Times is holding a video that shows Barack Obama celebrating with a group of Palestinians who are openly hostile towards Israel. Barack Obama even gives a toast to a former PLO operative at this celebration. If the American public saw this side of Barack Obama he would never be elected president. But, the media refuses to release this video. writer Peter Wallsten wrote about Barack Obama’s close association with former Palestinian operative Rashid Khalidi back in April. Wallston was one of the few mainstream media reporters to report on this radical Obama associate. Wallston said that the article was written after he watched video taken at the Khalidi going away party. When I asked him about the video he said that as far as he was concerned he was through with the story. I asked him if he was planning on releasing this video of Obama toasting the radical Khalidi at this Jew-bash. He told me he was not releasing the video. He also would not comment on his source for the video. Wallston also said he did not know if Khalidi’s good friend Bill Ayers was at the event or not. The LA Times has video of Obama toasting a former PLO operative at a Jew-bash but will not release the video. Barack Obama funnelled thousands of dollars of cash to Rashidi’s anti-Israel Foundation through his work on the Woods Fund. In 2000, Rashid Khalidi, a former PLO operative who justified Palestinian terrorism as contributing to “political enlightenment,” threw a fundraiser for his friend Barack Obama. UPDATE (10/28/2008 – 07:32 A.M. EST): LA Times to America: “Yeah, we’ve got the tape and we’re not releasing it…so what? We’ve got bigger fish to fry, such as our ever-present layoffs!” Nothing combats plummeting circulation figures quite like p#ssing off readers. Deathbed Media, indeed. Sent by a friend. Enjoy! On my way to lunch, I passed a homeless guy with a sign that read ‘Vote Obama, I need the money,’ I laughed. In a local restaurant my server had on a “Obama 08” tie; again, I laughed as he had given away his political preference–just imagine the coincidence. When the bill came, I decided not to tip the server and explained to him that I was exploring the Obama redistribution of wealth concept. He stood there in disbelief while I told him that I was going to redistribute his tip to someone who I deemed more in need–the homeless guy outside. The server angrily stormed from my sight. If you look at the victories and failures of the civil rights movement and its litigation strategy in the court. I think where it succeeded was to invest formal rights in previously dispossessed people, so that now I would have the right to vote. I would now be able to sit at the lunch counter and order as long as I could pay for it I’d be o.k. But, the Supreme Court never ventured into the issues of redistribution of wealth, and of more basic issues such as political and economic justice in society. He thinks the Warren Court was not that radical??? But hey, where on Earth would you get the crazy idea that the man is an anti-American Marxist? When you read this, WordPress blogs (including this one) will be back up. While I can update my blog, no one else can see it until WordPress gets the problem fixed. Let the record show that it’s been down all morning, and that as of right now (noon EST), it’s still down. UPDATE (10/27/2008 – 01:15 P.M. EST): Back up, for now. An Orlando anchorwoman asked Joe Biden that in light of The One’s recent “spread the wealth” comment, is Barry O a closet Marxist? For her insolence, the Obamessiah has cut off access to his campaign. Got that? When the Obama groupies of the MSM henpeck McCain about affairs with lobbyists that never happened and have no sources whatsoever, it’s merely hard-hitting investigative journalism. When The One of Supremely Thin Skin is asked about his obvious Marxist leanings, it’s “over-the-line”, “antagonistic”, and “unprofessional”! Got it. Thanks for the clarification. Aside from his “spread the wealth” comment to Joe the Plumber, and aside from the fact that in 2001, Barry O lamented that the US Supreme Court didn’t pursue “redistribution of wealth”, where would anybody get the notion that Obama is a Marxist? … The editors. The men and women you don’t see; the people who not only decide what goes in the paper, but what doesn’t; the managers who give the reporters their assignments and lay-out the editorial pages. They are the real culprits. Why? I think I know, because had my life taken a different path, I could have been one: Picture yourself in your 50s in a job where you’ve spent 30 years working your way to the top, to the cockpit of power . . . only to discover that you’re presiding over a dying industry. The Internet and alternative media are stealing your readers, your advertisers and your top young talent. Many of your peers shrewdly took golden parachutes and disappeared. Your job doesn’t have anywhere near the power and influence it did when your started your climb. The Newspaper Guild is too weak to protect you any more, and there is a very good chance you’ll lose your job before you cross that finish line, ten years hence, of retirement and a pension. In other words, you are facing career catastrophe -and desperate times call for desperate measures. Even if you have to risk everything on a single Hail Mary play. Even if you have to compromise the principles that got you here. After all, newspapers and network news are doomed anyway – all that counts is keeping them on life support until you can retire. And besides, you tell yourself, it’s all for the good of the country . . .
Nope Yep…no glaring liberal media bias! I can’t blame The One for the Fannie/Freddie mess that is crippling the economy, beyond his unwillingness to confront the issue head-on two years ago (like McCain did). After all, he wasn’t the only gutless politician with special interest ties to Fannie/Freddie…he was only the second biggest recipient of their largesse. Barack Obama has re mained cool and confident amid the financial melt down, even as John McCain at times has been embarrassing, lurching from one proposal to the next. But while the polls are reflecting Obama’s steady hand, the markets haven’t. In fact, they’re getting worse by the day as Obama’s lead widens. Most investors know the devil is in the details – and the details of Obama’s economic plans are anything but reassuring. It could be a lot lower – it all depends on the policies of the next president. Recently, Obama said he wants to expedite loans to small businesses, so he seems to have a clue that they produce much of the country’s job growth. Yet his income-tax hike on upper brackets will hit vast numbers of small businesses – they’d face the highest rates they’ve seen in decades. Overall, his plan includes some of the most lethal tax increases imaginable, including a jump in the capital-gains rate. He’d expand government spending massively, with everything from new public-works projects to increases in foreign aid to a surge in Afghanistan – plus hand out a token $500 welfare check that he calls a tax cut to everyone else. This is clearly the wrong way to go in the wake of an economic meltdown – yet Obama, for all his talk of how willing he is to compromise, of how he’d bring people together, is sticking to his tax guns. I know at least one top Wall Street executive, an Obama supporter from the start of his campaign, who has recently urged Obama to rethink his tax plan – and that was before last week’s record losses on the Dow. And if he governs like a liberal ideologue – with a belief that the government that works best is the one that’s biggest and raises taxes the most – he won’t even have to work hard to get his way. House Speaker Nancy Pelosi and Senate Majority Leader Harry Reid won’t stop him – the Democratic majorities in Congress are only likely to grow. Pethokoukis gives his top five indications that the markets fear Uhhhh-bama. As well they should fear him. The American people are so frightened right now in these turbulent times (understandably so)that they are willing to elect a leftist empty-suited wimp to run the country, just for “change” sake. They need to be careful what they wish for, because the economic devastation that will result from capital flight from the markets will exacerbate an already limping economy. The Uniter, a post-racial guy? Pffffft. Obama admits his Redistribution of Wealth is to SAVE the African American community SO HE CAN ENSURE HIS OWN SALVATION! (and Our Countries Salvation) He compares the plight of African Americas to the ethic genocide’s of Bosnia and Africa. He blames all of African American’s problems on “ONE GROUP” who suppresses them. And He says WHITE people don’t want their taxes to help black children. Obviously, Obama’s plans to redistribute wealth is not something he just thought up. Funny- This is the same millionaire who won’t send his brother living in a slum hut 20 bucks. When they’re not busy getting renowned kiddie p0rn authors elected to represent them in the Senate, depraved liberals in Virginia like to spend their time disenfranchising the very people who fight to allow them to elect said perverts to public office. Allowing nonresident college students to vote in VA? Check. Visiting prisons to get convicts to vote? Check. Trying to help military personnel (who, as polls show, vote overwhelmingly against Democrats) vote? Not quite. But hey…the left “supports the troops”, right? Phillipians 2:3-4 says “3 Do nothing from selfishness or empty conceit, but with humility of mind regard one another as more important than yourselves; 4 do not merely look out for your own personal interests, but also for the interests of others.” Ignore this at your own peril. The One breaks federal law on purpose, the MSM yawns…all another day at the office in the Deathbed Media. And judging by the hemorrhaging at the NYT, I’d say “Deathbed Media” is appropriate, no? “Just a guy in Uhhhhhh-bama’s neighborhood” wanted to exterminate 25 million Americans who were too capitalistic for his liking. Judgment…and stuff. Matthew 7:15-16: “15 Beware of the false prophets, who come to you in sheep’s clothing, but inwardly are ravenous wolves. 16 You will know them by their fruits.” The One’s fruits are rancid.